I’ve just ordered a motability car, it was one they had in a showroom, they’ve gone and charged me £215 for a dash cam that’s fitted, is this allowed? its caused an affordability issue but if I don’t pay it I’ll be waiting months for another car so I’ve got no choice but doesn’t seem right to me and have never heard of this before. so is it full cost of the PIP monthly mobility element? why cant they take it out? Yes it is and no idea, surely this is wrong? I questioned it but they weren't having it. And yes it's hard wired but could be removed. sadly i'm pretty sure they can do it. pers why don't you go elsewhere? so in a nutshell they want an upfront sum to release the car to you I expect. But I'm paying £595 for the car upfront before paying for that!! why cant you go elsewhere? I can but my car needs to go back due to worsening health conditions which is why motability agreed to cancel my existing car. I can't wait until then because of the issues my car is causing, so I don't have many options and this is the car that was suitable, so its a real pain. If its an optional extra and you have not requested it then it should be removed or offered to you at an extra additional price. If its already fitted and included....then surely it cant be an optional extra ? they provide cars with built in extras that bump up the 'take away' sum that needs to be paid before you can take the car then its paid by all or some of the mobility payment of the benefit the buyer gets. you can ask for extras to be fitted at a cost, but you cant have them 'taken off'...its part of the packages the dealers sign up to with Motability that they must provide or bided for to get on the Motability scheme and be an approved dealer. we wanted the winter pack that was offered on our car, took 6 weeks to get it done when the package was already on the shelf at the dealer, they had to get approval to fit it. Dash cams are not listed on the official Motability scheme as a required optional extra ? interesting as that was an option when we had ours 2 trs ago. Well, I’m really unhappy with the whole situation I’ll start at the beginning. Also to clarify what colour do you think or would you say this car is would you say brown and black? If it were me I'd have gone for one of the sister cars - Nissan Qashqai. Never did like Renaults colours particularly there take on what you say is brown/black, don't see how the can call that If it were me I'd have gone for one of the sister cars - Nissan Qashqai. Never did like Renaults colours particularly there take on what you say is brown/black, don't see how the can call that orange unless I need to go to Specsavers again. Yep to me it isn’t as advertised, there’s the issues with the Renault I wanted and the dashcam issue meaning I had to have this one. No inspection before entering my PIN. 12 miles on the clock and it definitely isn’t Desert 12 miles on the clock and it definitely isn’t Desert Orange/Black, it’s Brown/Black and I really don’t like that either. And I would have liked to have had a Qashqai but I can only drive automatics and with the heated seats which I wanted it was well over £1,000. The Captur GT Line with heated seats was £595 which was about my maximum budget. I'm not happy with this one but I won’t be able to cancel. i had to cancel my Clio on Motability that I only had for 8 months because of worsening health issues and I needed a car with much higher seat so I could get out without feeling like I was climbing out of the car everytime I got out. In an email Motability have said I should have pulled out if I didn’t want this one even if I was pressured. I've sent them a response with a picture of the car and again stated all the issues. They've said if I wanted it referred to the Customer Relations team it will be so that’s what I’ve requested. I don’t expect much to happen but we will see. Thank you I will post there, hoping someone else here has an opinion or advice as well. 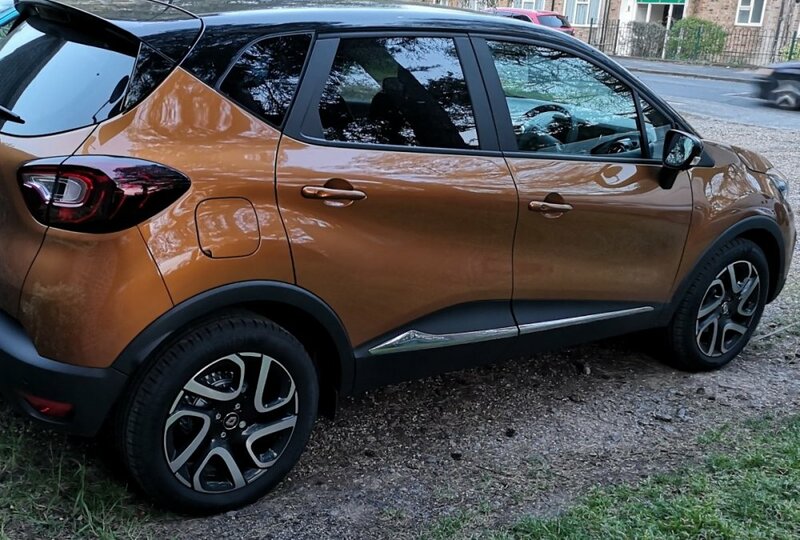 Renault didn’t cancel it and started playing hardball and I ended up with the Captur Iconic lower model without what I wanted or needed. Oh and they failed to offer or provide a test drive in either car, isn’t that against Motability rules?